So many of my friends are having babies that I am getting a chance to perfect my "you just had a baby" meal that I love to deliver. Getting to hold a teeny tiny baby is just a bonus. I am thinking of doing Endless Summer Minestrone for the most recent round of new babies. Do you have a recipe you like to delivery to friends who need some help? Rachael Ray stopped by a dog shelter during her book tour. According to Broadcasting & Cable, had a new season high in the week ending Oct. 24. Cookin' Lean like Paula Deen adapted a Rachael Ray recipe for Pumpkin Ravioli with Toasted Pumpkin Seeds. The Staten Island Advance informs us that Rachael Ray will be the guest speaker at the 49th annual Advance Women of Achievement awards luncheon Nov. 18 in Bloomfield. EZ Recipes features a review of Pretzel Crusted Chicken. Workout Then Cook features an adaptation of Rachael's recipe for Pumpkin Pasta. 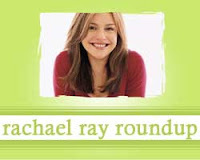 Taste and Tell's Saturdays with Rachael Ray features a review of Sloppy Lasagna. Hey, thanks for including my blog in your round up! I cook from her cookbook frequently, so please check back in the future!